New data from millennium-long tree-ring analyses are indicating that mountains in northern Pakistan have grown significantly wetter over the past century than they have been over the last millennium  quite possibly due to human-induced global warming, the researchers say. In the Karakorum and Himalaya mountains in northern Pakistan, the upper reaches of the Indus Valley (which supplies the world's largest irrigation network), a group of researchers collected samples of Juniper tree rings that dated back as far as A.D. 828. "Tree rings can tell a lot about precipitation changes over time," such as how much precipitation fell and whether it fell in the form of rain or snow, says Kerstin Treydte of the Swiss Federal Research Institute WSL in Birmensdorf, Switzerland, and lead author of the study in today's Nature. Treydte's team measured the oxygen isotope ratio in the rings and found that most of the precipitation in the region fell as snow, which they expected given the high elevations. And over the last 1,100 years, the hydrologic cycle there intensified at an unprecedented rate, Treydte says. The team suggests that the precipitation increases aren't just temporary changes, and the increases may be too great to be due to natural variability. 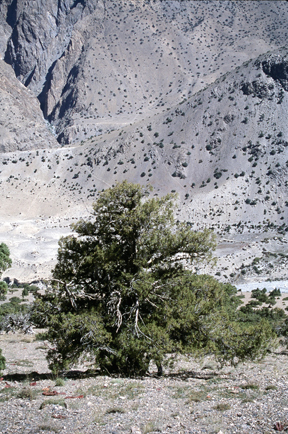 New isotopic research on the rings of 1,172-year-old Juniper trees in the mountains of northern Pakistan is revealing that the 20th century was the wettest century of the past millennium, possibly due to human-induced global warming. Image is courtesy of Kerstin Treydte. The tree rings revealed periods of wetter-than-normal weather that lasted about a decade, such as around the years 1200, 1350, 1500 and 1870, and drier periods around 1270, 1420, 1600 and 1720, the team reported. In the 1790s and 1890s, the tree ring record showed severe droughts, which correlate with historical records of drought and famines in India. The data collected from the tree rings also roughly corresponds to historical records of extreme weather in other parts of the world, Treydte and colleagues wrote. "But what is most significant, Treydte says, is "a cluster of peak precipitation periods during the late 19th and 20th centuries" that are at the upper limits of what the data show for the last 1,100 years. Furthermore, "we have empirical evidence that precipitation increased as temperatures increased," she says. Increasing global temperatures over the past 150 years are "at least partly" the result of "the increase in anthropogenic greenhouse gases during this time," the team wrote. "We're not atmospheric scientists," Treydte says, "so we're not going to argue that the increasing precipitation is directly caused by a carbon dioxide increase" in the atmosphere. "What we will say, is that at the same time as the Industrial Revolution began, [carbon dioxide] increased, and there was a coincidental increase in precipitation  so there could be a human role," she says. One of the biggest uncertainties in predicting climate change involves the hydrologic cycle  both "the net effect of water in the climate system and the way in which water will be redistributed over the surface of the planet," wrote Michael Evans of the Laboratory of Tree-Ring Research at the University of Arizona in Tucson in an accompanying commentary also in today's Nature. Understanding the hydrologic cycle and how it might be affected by warming temperatures is complex (see Geotimes, March 2006). But research indicates that warming temperatures can lead to increases in the moisture-holding capacity of the atmosphere, altering the hydrologic cycle and characteristics of precipitation events, including the frequency, amount, intensity and duration, Treydte and colleagues wrote. And Treydte's team's "compelling" results roughly match climate models' predictions for the hydrologic cycle's intensity, Evans wrote, which adds further support to the researchers' hypothesized link between certain climate change effects and increases in greenhouse gas emissions. Such a link would certainly help improve confidence in climate models, he wrote. Still, Evans noted, correlating anthropogenic climate change with the hydrologic cycle is tricky, as many factors must go into the models, and many uncertainties remain. Although this is the first tree-ring isotope record that is longer than a couple hundred years, more research is necessary. A denser network of precipitation gauges, for example, would help researchers distinguish natural variability from human-induced climate change, he wrote. "All of these advances will assist in the crucial work of climate-change detection and attribution."